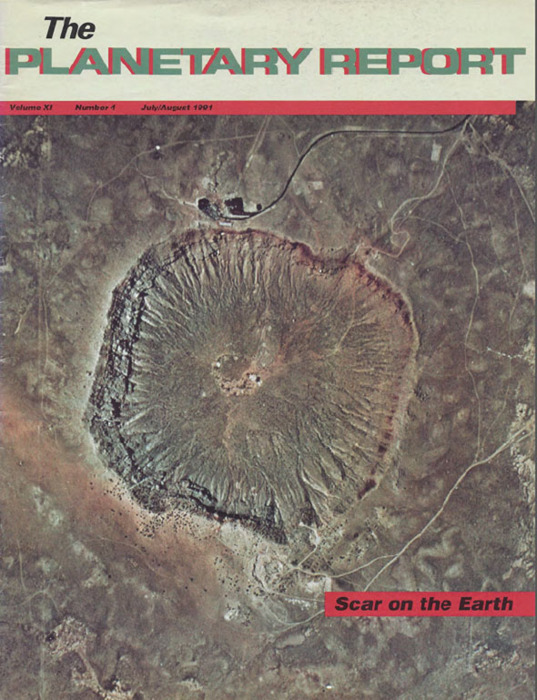 On the Cover: Scars like this are rare on Earth's face. Our home planet constantly resurfaces itself, eventually wiping clean the evidence that, over the aeons, it has been struck repeatedly by Objects from space. Meteor Crater in Arizona, pictured here, was once thought to be the remains of a volcanic eruption. A young planetary scientist named Eugene Shoemaker was the first to demonstrate that this crater was blasted out by an impacting asteroid. Shoemaker went on to illuminate the role of asteroids and comets in the history of our solar system. 4 What Now With the Soviets? Louis Friedman asks what will happen with future space missions with the dissolution of the Soviet Union. 8 Rovers! Using Mobile Robots as Planetary Explorers: Donna Pivirotto explains how we can explore other planets with robotic companions. 14 Revisiting Mars: Landslide in Ophir Chasma: Charlene Anderson showcases stunning Viking images of massive landslides in part of Mars' giant Valles Marineris. 18 Eugene Merle Shoemaker: A Pioneer of Planetary Science: Bettyann Kevles reflects on the important contributions Shoemaker made to the study of impact cratering. 23 And the Discoveries Continue: Asteroid Project Finds Six New Objects: Charlene Anderson presents the latest results of Eleanor "Glo" Helin's asteroid hunting. 3 Members' Dialogue Environmental effects of space shuttle launches; asteroid missions. 24 World Watch NASA budget update, Galileo, and upcoming Mars missions. 26 News & Reviews Being a bird on Titan. 27 Society Notes Rover news, Mars balloons, and space art. 28 Q&A Does lightning happen on other planets?